Within you lies the secret of your dreams--powerful spiritual and intuitive reserves that allow you to achieve your goals and transform your life. Learn how you can begin immediately to manifest everything you want or need with the step-by-step approach presented by Dr. Calabrese. Hundreds of her clients and students have achieved outstanding practical results using the methods in this book, which includes interactive workbook sections. When Adrian Calabrese's faithful car bit the dust, she was broke, and had already maxed out several credit cards. She went looking for her dream car anyway, and by the end of the day, she was the proud owner of a shiny new Jeep Cherokee. It was all because she had found the secret formula for getting what she wanted. Not long after that, money began flowing in her direction, she paid off all her debts, and her life turned around. 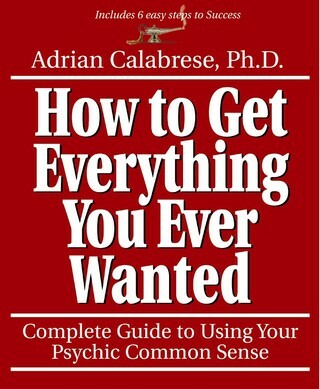 Now Adrian Calabrese shares her powerful method of applying ancient concepts of inner wisdom to everyday life. How to Get Everything You Ever Wanted will show you how you can begin immediately, to get everything out of life that you have ever desired.